New in 2015, the Bamboo Rolling Tray from Raw Rolling paper. Similar in style to the hugely expensive Kind Trays. 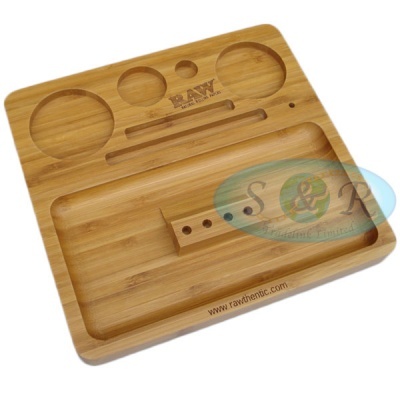 There are 4 round holes at the top to hold your Lighter, Grinder, Click Tin and other accessories. Sizes of these from Left to Right Approx. 60mm, 35mm, 16mm, 52mm. The Two slot underneath for papers, Single Wide, 1 1/4, and Kingsize Slim will fit. The main rolling platform has rounded edges, just like the metal trays, the central piece is held by a strong magnet, it also swivels in place and one edge is rounded. The bottom has foam on each corner to avoid scratching any surfaces. Raw logo's are etched in the top to finish it off.